Haven’t we had the most amazing February and March weather? Rummaging through the back of the wardrobe I dug out last year’s summer clothes and squeezed into my old three quarters. They seem to have shrunk considerably from having been hidden in the back of a cupboard. I know how we English like to chat about the weather; after all it is a great icebreaker. While the weather constantly changes we too have a continual flow of comments to make about it. As a nation we are a fickle lot, never really happy; about being so cold, asking ourselves why does it never stop raining? Now it’s too hot. We have been treated to some very diverse unseasonal weather over the last few weeks. Particularly this week, where some parts of the country are digging their way out of the snow; elsewhere some of us still bask under the record breaking hot sun. Or have we? Looking back over our climate patterns it appears to show some of the worst weather appears when we least expect it. As I write this, I am reminded of the wonderful Vicar of Dibley sketch where they discuss the Great Flood, no no no no it was the great wind. They move on to discuss the great snow which killed off Gladis, or was that in the great frost of 54 maybe it was the twins who froze to death in the great freeze of 48. The sketch sums up our fascination with the climate and gives us specific dates on which to hang our memorable reference points. In the past we have had certain years where the weather has been front page news. The winter of 1962 -3; snow blizzards swept across Britain on Boxing Day covering the country in a thick blanket of snow up to 20 inches in some places. It continued to snow until the beginning of March when the land began to defrost. I am just too young to actually remember anything about that time. I know my heavily pregnant mother returned to Hampshire from Devon; a week after my father had returned to work after the Christmas break. Her father, not smitten by young love or a pregnant brain was concerned enough to insist he went with her. Her sister followed behind in convoy; they slushed and slipped for seven whole hours before finally reaching home. Grandfather not only stayed and met his granddaughter 5 days later, he ended up staying till March before he was able to travel back home. In 1976, however I do remember the heat, those awful stand pipes which I never thought we would see again. I remember the forest fires and the jumpy images on the telly as the cameraman moved around filming the footage. I can remember the fields and lawns all being parched and browning in the scorching sun. I also remember that I was in Spain that summer where the heat had been so extreme they had monsoon type flooding. I arrived home to find my family and friends executing an extraordinary series of ritualistic movements that turned out to be called a rain dance in the garden. As this spectacle greeted my arrival the heavens opened and we were deluged, I was revered as having brought the rain from Spain. Back at school I was the only girl, not only in my class but in the whole convent school to return without a deep golden tan. My skin having spent three weeks covered up and indoors was pasty and white and remained so until the following summer. Sandwiching these two extremes was August 1952 in Lynmouth, on the North Devon coast where following a prolonged dry spell the whole of the exe valley became waterlogged when it started to rain. The area drained into twin rivers East and West Lyn which subsequently flooded the village of Lynmouth destroying property and killing 34 people. Lynmouth has of course been rebuilt with monuments standing testimony to the sad events of that night. Topping the sandwich was of course the fateful night exactly 52 years later in August 2004. We probably all remember when the quaint Cornish town of Boscastle was destroyed overnight in an appalling flood which swept down through the town miraculously not claiming any lives but causing a lot of damage. Our memories will be enhanced by the capture on film of the dramatic events as they unfolded before our eyes. I have been to Boscastle since the rebuilding of the town to see the dedicated display, depicting before, after and during. The extremes did not stop in Cornwall. Latterly we had the summer of 2007 when flooding across the midriff of Britain caused so much damage and misery. 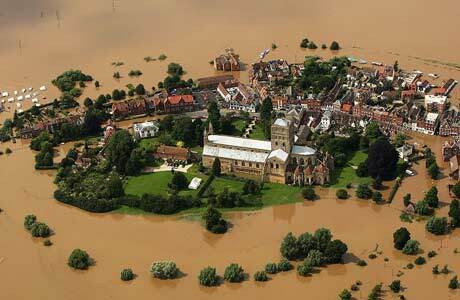 The iconic picture of Tewkesbury Abbey; surrounded by water detailing the extent of devastation, is still ingrained in my and many others memory. We were party to this disaster watching it unfold daily as the helicopter circled round and round over the once rolling lands of middle Britain. I am sure there will be many people who still retain the memory not only of the flood but the emotion as they saw their homes ravaged by the torrent of water. All these floods took place during the summer months following periods of particularly dry spells when the sudden rainfall waterlogs the ground with its ferocious intensity. Should we be crises stocking up with the sand bags now just in case there is a shortage. Or will the 12 inches of snow covering Northern Britain saturate the ground enough, for our crops to grow big and strong rather than drown in a mass of melted mire. I have sadly reverted back to black. My brightly coloured summer floaty tops have again been replaced by black leggings and heavy top. I will refrain from casting them back into the cupboard however just in case a rise in temperature returns allowing me to slip my weighty woolly off to reveal summer colours bursting out from underneath. I was given my first commission the other day. I was asked to write a press release about a friend’s rugby playing son who has been picked to represent England Independent Schools in Italy over the Easter holidays. Naturally I leapt at the opportunity and to my delight and theirs it was published in both the papers I have sent it to. I am in a quandary however about what to do with the first book “memories”. I need to address the accuracy of the points highlighted but my reader cannot remember which they were. She is going to reread for me. Do I wait for her to come back or do I bite the next bullet and send it out again and who to this time. I am tempted to send it to an agent but not sure I am ready for the rejection just yet.